When the Halloween parties are over and the weeks between then and Thanksgiving fly by, we all start to feel busy with the rush of the holidays. Amidst all of the planning and the cooking for your Thanksgiving dinner, you still need to find time to keep your little ones entertained and occupied. From crafts to keep the kids amused during Thanksgiving dinner to festive crafts that teach them about the giving season, we’ve got you covered. 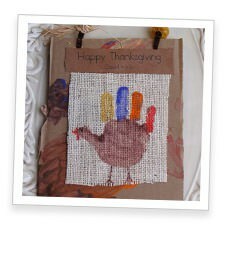 Here are 41 Thanksgiving crafts that your kids can make this season, some that are perfect as decorations and others that become great toys and activities for the whole family. So pick and choose your favorite and celebrate Thanksgiving with the entire family. Great for kids of all ages, this memorable Mayflower hand print can be framed or kept in a memory box for you to remember for years to come. If you’re looking for a craft that will keep the kids busy even after it’s made, try out these turkey bowling pins and let the little ones loose for a great Thanksgiving game. Perfect for the kid’s table centerpiece, help your little ones make this fun paper bag turkey and fill it up with their favorite snack. This adorable feather headband is great for older kids to make for themselves and their little siblings to wear. You’ll have a pow wow in your own home with this cute craft. If you kids didn’t get the chance to make this popular Thanksgiving craft at school, don’t let them miss out and follow this step-by-step tutorial. Inspired by nature and easy to make, feather pens are great to make in spirit of the Thanksgiving holiday, so get creative with this beautiful craft. 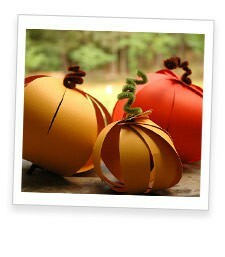 Easy and inexpensive, paper pumpkins are great for all ages and look wonderful as fall decorations in your home. These easy-to-make pumpkin paintings are perfect for kids of all ages and require only a few supplies. They also make very little mess. Give thanks with your whole family and create a thanks and giving tree that you can display in your living room and add onto all season. Thanksgiving is about showing your gratitude to the ones your care about, so in light of this thankful time of year, help your kids make a thoughtful Thanksgiving mobile. 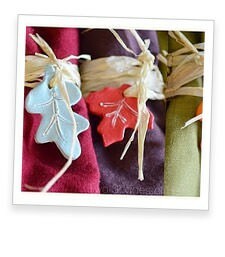 The perfect touch to a beautiful Thanksgiving spread, have your kids help make these fall leaf napkin tags out of modeling clay and paint. Halloween isn’t the only time you can dress up in costume and this Indian vest is perfect for a Thanksgiving feast with little Pilgrims and Indians. A tasty Thanksgiving treat that requires nothing more than a box of cake, ice cream cones and pretzels. To celebrate your baby’s first Thanksgiving, stamp their little hand and create a cute turkey that’s perfect as a card to send to family or as a keepsake in their baby book. Perfect for a day indoors and easy to make in the kitchen, your kids will love to craft this adorable Thanksgiving turkey out of salt dough. For a thoughtful Thanksgiving keepsake from your little ones, help them make a hand print turkey this year that’s great for little hands. For a delicious treat for your dinner guests, try out these chocolaty Pilgrim hat cookies that everyone will love. Sail the high seas and channel Christopher Columbus with a Mayflower replica that brings gifts and thanks to your Thanksgiving holiday. Finger painting never fails to entertain the kids, so why not have them create an autumn tree that you can display every year. Sure to get the kids into the Thanksgiving spirit, these paper Pilgrims hats will look adorable on at your turkey dinner. This pencil holder serves two purposes, one is to keep the kids creative with a fun craft and two is to keep the kids entertained during a long Thanksgiving dinner with colored pencils for their coloring books. 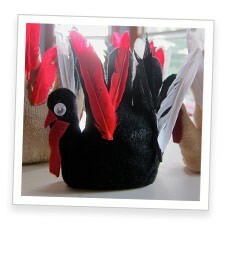 With some felt and a few googly eyes, you can make a festive Turkey Tom advent calendar this season. And use a skinny dowel in the fabric to keep your calendar lying flat against the wall. Surprise your dinner guests with a little note of thanks inside their dinner roll. Grab some pre-made croissants or rolls to make things easier. Work on your kids’ fine motor skills with this beaded Indian corn magnet craft that will look great on your fridge during the fall months. If you bought your pumpkins late this year, use them for a Thanksgiving dinner centerpiece and turn your squash into a turkey. Great for young or older kids, this mod podge vase only requires an old soda bottle, tissue paper and glue and your little turkey will create a masterpiece to be proud of. 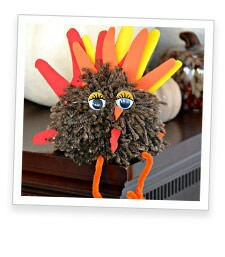 For an adorable Thanksgiving craft your kids will love to make and love to play with even more, try your hand at these easy-to-make pom pom turkeys. Hang this beautiful Thanksgiving garland across your favorite window and display your kids’ thankful craft in celebration of the holiday. Great for young kids, this simple craft takes an old wooden spoon and transforms it into a happy turkey that you can use as a puppet or even a centerpiece for Thanksgiving dinner. All you need is a cereal box, a bundle of straw and paint and you’ve got a cheeky scarecrow perfect for an indoor Thanksgiving decoration. 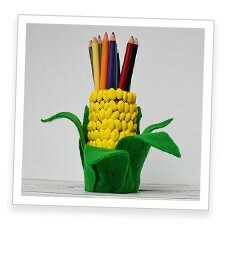 Show your kids how the Native Americans taught the Pilgrims to grow corn with these handmade Indian corn cobs. Give the kids a chance to stuff their own turkeys with this gloved turkey craft and watch them make a new fluffy friend to add to their toy collection. For your little ones that love their play dough, this easy-to-make feathered turkey is a great craft to make in celebration of Thanksgiving. The perfect healthy snack, a veggie pizza leaf filled with broccoli, peppers and carrots is the best way for the whole family to eat light this Thanksgiving season. Help your kids find their inner chef and make a play salad out of craft foam and sponges. Pair this with the paper turkey and you’ll have a Thanksgiving dinner that’s great for the kid’s table. For an easy craft for your toddler, gather some construction paper, glue and a few googly eyes and help your little ones make a geometrical turkey. Teach your kids to be thankful with a thankful heart turkey where they can write who or what they are grateful for this year. Your little ones will enjoy helping you make this adorable turkey puppet, but they’ll love to see the finished product of 10 fat turkeys in a row. Let the little ones help out with the Thanksgiving dinner preparations and have them make these cute corn cupcakes out of M&Ms and icing. An adorable addition to your Thanksgiving decorations and easy to make with just a few supplies and pine cones from your back yard. Make your own pumpkin play dough with items you can find in your pantry and let your little one make little pumpkin pie shapes with cookie cutters.